STORY OF SEASONS: Trio of Towns released back on February 28th in North America. It is the most recent entry in a farming sim series developed by Marvelous in Japan, localized and recently re-branded in the west by XSEED. Trio of Towns much improves upon the first STORY OF SEASONS. Players move in, in between 3 distinctly different neighboring towns, with dreams of becoming a farmer. Each village has its own regional crops, marriage candidates, pets, livestock, furniture, decorations, festivals and more. After XSEED informed fans of how costly and time consuming localizing the DLC would be, numerous STORY OF SEASONS/Bokujō Monogatari fans told them how they would gladly pay for the DLC if they took the time to localize it. And now it’s finally coming out on November 9th. STORY OF SEASONS: Trio of Towns will receive two new romance options, Stephanie the contest MC and Woofio, the contest judge who you see at contests wearing a dog suit. In addition to these two new options the “New Neighbors Pack” DLC will also include new friendship events, winter outfits, NPC dialogue and story content. Not only that, but a brand new Trio of Towns 3DS theme will be released that same day as well, at a price of $1.99. The DLC pack itself will cost $7.99. To buy this DLC you are required to update your game with the free 1.1 version update. This update has various gameplay improvements and includes four new Rune Factory 4 themed outfits based on Lest and Frey, the RF4 main characters. 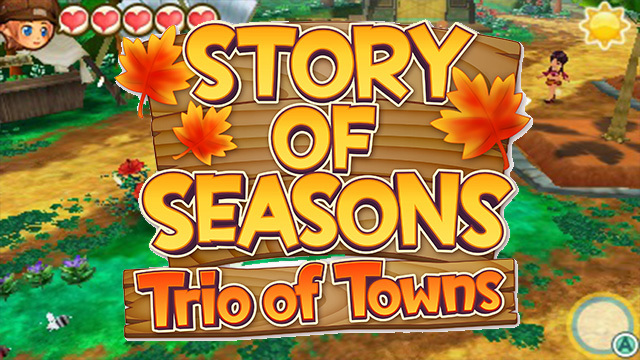 If you have yet to even grab yourself a copy of STORY OF SEASONS: Trio of Towns, it can be purchased for $39.99.